Lower your lap times with a 5-point safety harness! That's right; installing a 5-point safety harness will not only greatly aid your personal safety, it will also seem to make you a better driver! Lap times usually drop when stock safety belts are replaced with a true 5-point harness system because a surprising amount of effort is needed to stay in the driver's seat and maintain some semblance of control of the vehicle when at speed on a racetrack. A Crow 5-point harness will keep you securely in place behind the wheel. You will be able to focus more on driving your Mustang once the distraction of trying to stay in the seat is gone. 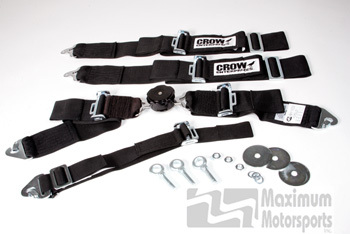 Crow's Rotary Cam Lock 5-point safety harness was our choice for the driver restraints in our own racecar. The design of the Crow release knob, with its smooth exterior, prevents accidental release, unlike the more common lever release types that can be bumped and accidentally opened. Lap belts and shoulder belts are 3" wide, and the anti-submarine strap is 2" wide. 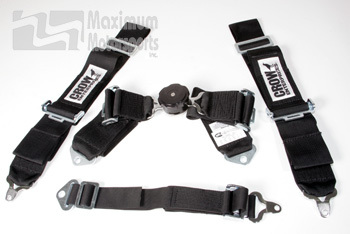 The Crow belts are designed to function as a complete 5-point harness. It is not safe to use the lap belts and shoulder harness without an anti-submarine strap. Clip-in lap and anti-submarine belts-- These have a quick-release clip attached to the end of the belt. The clip is to be attached to an eyebolt that is securely mounted to the car. Eyebolts are included. Bolt-in lap and anti-submarine belts-- These have steel tabs (with bolt holes) attached to the end of the belt. The tab is to be bolted to the vehicle with Grade 8 hardware. As each installation is unique to the vehicle, attachment hardware is not included. Wrap-around shoulder belts-- This style of belt mounts to the roll cage by wrapping the belt around the roll cage harness mount tube, and then attaching the belt to itself with the supplied buckle. Check your sanctioning body's rules--most require replacement of belts that are more than two years old. Belts have sewn-in tags with the date of manufacture. Crow lap belts and shoulder harnesses are SFI 16-1 rated. The 5-point belts kits are sold only in black. Each 5-point safety harness outfits one seat. When properly adjusted and attached to the lap and shoulder belts it allows those belts to be properly tightened. Without the anti-submarine strap, as the shoulder belts are tightened they will pull the lap belt up and out of the proper position. Without an anti-submarine strap the other belts can't be properly tightened, preventing the seat occupant from being properly restrained, and resulting in a much higher likelihood of injury in an accident. In an accident, the anti-submarine strap prevents the seat occupant from sliding forward and under the lap belt. "Submarining" under the belts will greatly increase the possibility of injury in an accident.